A Palladian villa located on the bank of the Thames between Richmond and Twickenham, Marble Hill House was built in the mid to late 172os for Henrietta Howard, mistress of King George II and later Countess of Suffolk. The symmetrical property – seen as a model for later Georgian-era villas in both England and overseas – was constructed by Roger Morris. He, along with Henry Herbert – a friend of the countess and later the 9th Earl of Pembroke – was also involved in its design as was Colen Campbell, architect to the Prince of Wales and future King George II, who is believed to have drawn up the first sketch designs for the house. As well as being familiar with the work of neo-Palladian Inigo Jones, Lord Herbert had travelled in Italy and there is it believed had directly encountered the works of sixteenth century Italian architect Andrea Palladio whose architecture the property emulated (see our earlier post on Chiswick House here). Key rooms include the ‘great room’ – a perfect cube, this is the central room of the house and boasts a wealth of gilded carvings; the dining parlour which had hand-painted Chinese wallpaper; and, Lady Suffolk’s rather sparsely furnished but nonetheless impressive, bedchamber. Howard, who as well as being a mistress of King George II both before and after his accession to the throne in 1727, was a Woman of the Bedchamber to his wife, Queen Caroline of Ansbach, and, as a result, initially spent little time at the property (which coincidentally was built using money the King had given her while he was still Prince of Wales). But after she become the Countess of Suffolk in 1731 when her estranged husband Charles Howard became 9th Earl of Suffolk after his brothers’ deaths, Lady Suffolk was appointed Mistress of the Robes, and following the death of her husband in 1733, retired from court. In 1735 following the end of her intimate relationship with the King, she married a second time, this time happily, to George Berkeley, younger brother of the 3rd Earl of Berkeley and an MP. Together the new couple split their time between a house in Savile Row and Marble Hill. Her husband died in 1746 and Lady Suffolk, who had come to be considered a very “model of decorum”, died at Marble Hill in 1767. Among the visitors who had spent time at the property were poet and neighbour Alexander Pope (responsible for the design of the grounds along with royal landscape gardener Charles Bridgeman), writer and satirist Jonathan Swift, and, in Lady Suffolk’s later years, Horace Walpole – son of PM Sir Robert Walpole and builder of the Gothic masterpiece Strawberry Hill. Following Lady Suffolk’s death, later residents of the property included another Royal Mistress – Mrs Fitzherbert, mistress to the future King George IV, Swedenborgian Charles Augustus Tulk and Jonathan Peel, brother of Sir Robert Peel (you can read more about Sir Robert Peel here). Following the latter’s death, the house stood empty for many years before publication of plans for a redevelopment by then owner William Cunard caused a public outcry which saw the property pass into the hands of the London County Council around the year 1900. The house opened to the public as a tea room in 1903 and remained as such until the mid-1960s when, now in the hands of the Greater London Council, it underwent a major restoration project and was reopened as a museum. In 1996, the house – which now stands on 66 acres and can be seen in a much lauded view from Richmond Hill – came into the care of English Heritage. 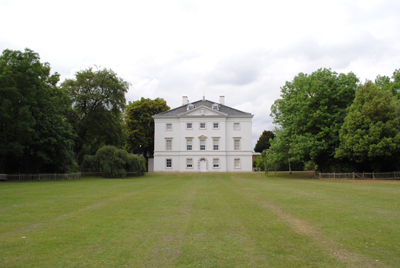 The grounds – Marble Hill Park – are open to the public for free and include a cafe located in the former coach house. 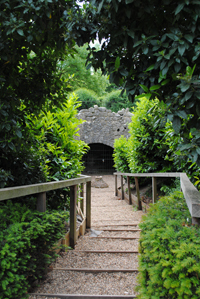 Other features in the grounds include Lady Suffolk’s Grotto – pictured above – based on one at Pope’s residence nearby. It was restored after being rediscovered in the 1980s. WHERE: Marble Hill House, Richmond Road, Twickenham (nearest Tub-e station is Richmond (1 miles) or train stations at St Margaret’s or Twickenham); WHEN: Various times Saturday and Sunday – entry to the house by guided tour only; COST: £5.90 adults/£3.50 children (5-15 years)/£5.30 concession/£15.30 family; WEBSITE: www.english-heritage.org.uk/daysout/properties/marble-hill-house/.